I went to college to become a doctor but along the way, the business world pulled me away leading to me became a stock broker instead. I loved taking my clients to lunch and fell in love with restaurants. I was so dazzled that I decided to open one myself. On opening night, what started out as a nice gathering with family and friends turned into a not-so-enjoyable time when I noticed that our guests were not getting great service. Immediately I got up from the table, leaving my wife and friends, essentially ruining their dinner, put on an apron, rolled up my sleeves and began my career as a restauranteur that very moment. After successfully turning that one night into a learning experience, the restaurant – called Ray’s Boathouse – eventually became well known in the Pacific Northwest. Building on my success at Ray’s it was time to develop my own restaurant without partners or investors. It filled me with pride to see my own name on a sign hanging outside my own restaurant. And, it was especially meaningful to me because I was named after my Dad, a flashy pilot in WWII. He was one of the biggest influences in my life: my Dad inspired me to expect a lot from myself, he cared deeply about kids and was filled with fun and vitality. 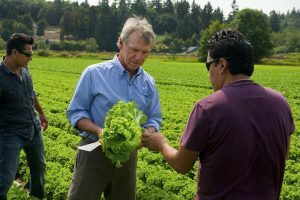 Everything on the menu is sustainably sourced, even the lettuce! Even though my career was in business, I never stopped studying cures for diseases and medical science. I was always fascinated. Several years later in the late 70s, having been a fan of diet drinks, I ran across a study about aspartame which revealed that small amounts of it were carcinogenic. I immediately threw away my cans of TAB and I’ll never forget walking into the kitchen in my own restaurant and reading the labels with a new eye. My medical science interest was revived at that very moment. I began eliminating trans-fats, high fructose corn syrup, growth hormones and a whole boat-load of artificial ingredients. Once I got rid of all those color and flavor enhancers, I was pleasantly surprised to find that not only did the food look as wonderful as always, it actually tasted better! I went on to win the Seattle Chowder Cook-off contest three years in a row. In year four, I was asked to step out of the contest and instead become a judge because restaurants were threatening not to compete at all. When I agreed to step out of the contest, the organizers gave me the Golden Ladle award and finally, the light bulb went off: it’s time to become a Chowder House. 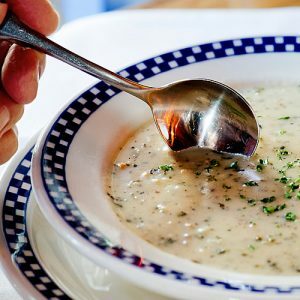 We soon grew to six locations and, today, nearly 40 years later, Duke’s has served millions of guests from all over the world our signature Award Winning Clam Chowder and other memorable seafood dishes. And then there was another pivotal moment in the mid-80s when I was invited to Alaska to see how fish were handled. As I stood in the processing plant, watching the fish being unloaded from the boats, it struck me that I had no idea how the fish were caught, how they were handled, were they bled and iced, and how much difference did it make. From then on, when I went to Alaska I was always on the boats to see things first-hand. My education led me to discover that fresh seafood isn’t really fresh – it can be as old as 27 days and still be called “fresh.” That’s why I developed an innovative new concept: “ice chilled, better than fresh” seafood. Essentially, this is seafood which is frozen to minus 40 degrees within 48 hours of capture. With each trip that I took to Alaska over the next 30 years, I observed a lot and became increasingly alarmed: I saw salmon unloaded from a fishing vessel but sitting on the dock with no ice covering it. It lead to a frozen product that failed miserably 8 months later. I saw fresh seafood sitting on the tarmac of an airport in Alaska in 80 degree sunshine, no protection and ruined before it arrived at its destination. I checked the temperature of fish coming off boats and realized that not every fisherman ices their fish properly. Fish that is not iced properly loses ½ day of freshness for every degree above 32 degrees. All of this inspired me to institute procedures and standards to ensure the seafood served in my restaurants is the best on the planet. 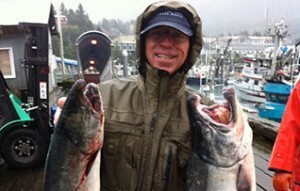 And, along the way, I discovered that our salmon and steelhead are endangered species on the West Coast. There isn’t even enough salmon to conduct old fashioned fishing derbies. Historically millions of fish swam in our Pacific Northwest waters. Now, 90 – 94% of them are gone. We are running out of salmon locally, forcing us to catch seafood further north in Alaska where the waters remain pristine. But, I can no longer sit by idly without doing something to restore this vital resource in the Pacific Ocean. My promise is that I will do everything I can to make sure that there is plenty of wild salmon and steelhead for our grandchildren and our grandchildren’s grandchildren. To create and implement a solution to restore wild salmon in the Pacific Ocean to its historic levels. To keep serving 100% sustainable, delicious seafood, meats, daily, vegetables, and fruit to the thousands of customers who love coming to my restaurants.